“This year, I’m really looking forward to go to the sea. I’ve been working for half a decade but it was more than ten years ago when I last visited a beach and felt the sand, the sun, the sting, and the itch on my eyes as I tried to take a peek of the murky view underneath the water. There is something intimidating about the sea; its immensity makes me tremble on how small I compare and it makes me imagine sinking, drowning, and running out of breath as this beautiful work of nature tries to embrace and claim me as its own. But this, too, is the calmness of the sea; it makes you feel how tiny you and your problems are. It silently tells you that you do not matter – that you are a speck of dust that could be washed off easily, and that the same goes for all of your troubles that wouldn’t even leave a mark on the ever-replenishing shore. I remember that my husband told me how fear is a life-killer; how fear cripples a person and makes him hesitant to pursue what he wants because of a small chance of an unpleasant outcome. “But what if it doesn’t happen?” he asked. And then I understood the entire point which I had been refusing to listen to even if it was just there in the back of my mind. Let me quote the former First Sword of Bravoos for we shall live long enough to enjoy what this century has to offer. 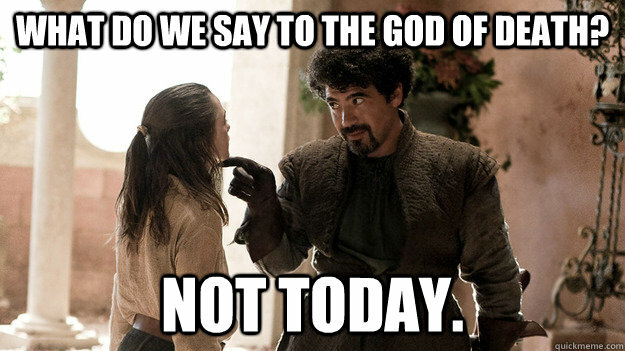 “What do we say to the god of death?